Two-stage valve stacks offer versatility, but are harder to understand. Previous examples have shown that shim, separator and base changes affect the entire damping curve, and not always as expected. Our focus will be to understand how valving changes affect the damping curve and to be able to target specific areas of that curve. In Valving 102 we state, "The entire load-deflection curve must be considered when revalving a shim stack." This is true, but unfortunately our current suspension dyno is not capable of running a fork or shock through its entire velocity range. It would take a $140,000 dyno to run at these velocities, and that would still have some limitations. 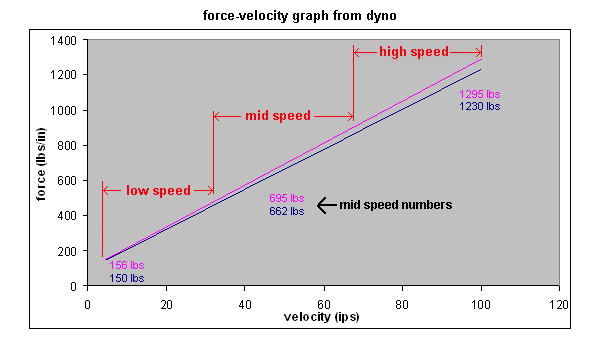 This next section will explain how we utilize the dynos' ability to accurately measure the low speed and mid speed damping forces, and how we can extrapolate the high speed forces from these numbers. Valving changes alter the entire damping curve by increasing or decreasing forces on different ends of the curve. When we make valving changes, we are adjusting the entire curve. Chart 1 shows an original damping curve in blue. 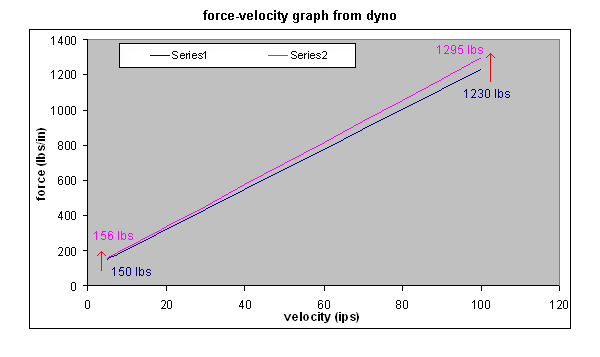 For this example, the pink line shows the altered curve where the low speed forces were increased from 150 lbs to 156 lbs, and the high speed forces were increase from 1230 lbs to 1295 lbs (force numbers from dyno). Whatever shims changes are made, the low speed forces are going to start where they start, the high speed forces are going to end where they end, and the middle is going to fall in between. For tuning purposes, we can alter the beginning and ending numbers, but we can't change just the middle. Therefore, when making valving changes, we will always look at how the shim changes affect the entire curve, with emphasis on the beginning and end of the curve. The velocity range on this graph is 0 - 100 ips (0 - 2.5m/s). This approximates the entire velocity range for a dirt bike shock (front forks can exceed 200ips). The majority of the time however, the shock operates in the middle ranges. 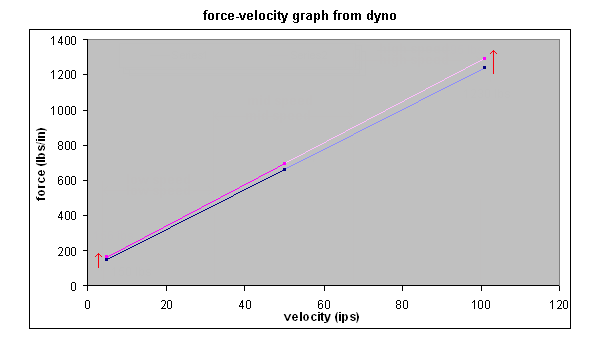 Chart 2 shows how the dyno's force-velocity curve might translate to the suspensions performance on the track (very approximate for this example). Chart 3 combines Chart 1 and 2. 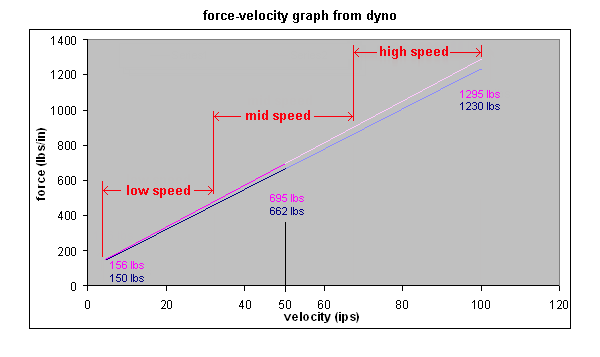 Notice the mid speed dyno force numbers are displayed on the graph. The force-velocity curves created by the suspension dyno will show the velocity range of 1 - 50 ips. Remember, most suspension dynos are not capable of running a damper through its entire velocity range. To see the force it takes to open the shims, look at 1-4 ips (inch per second). For low speed comparisons, look at the 5 ips force numbers. For mid speed comparisons, look at the 50 ips force numbers. For high speed, we will not look directly at any numbers. High speed force numbers will fall where they may, and will result from the force-velocity graph line created by connecting the low speed and mid speed numbers. In other words, if more high speed is needed, we will alter the shim stack and measure the force increase at mid speed on the dyno, and extrapolate that change to high speed. 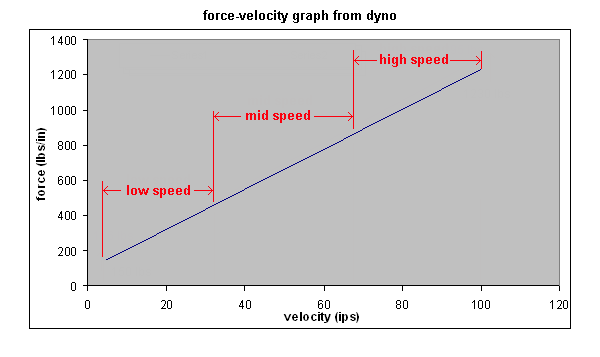 Chart 4 shows the force-velocity curve from the dyno, and how we can extrapolate the high speed force numbers. The 5 - 50 ips section of the graph lines are the darker colored lines, and the 51 - 100 ips section of the graph lines are lightener. We will be making valving adjustments based on the 5 ips and 50 ips force numbers. In the below example, low speed needed to be increased, so the low speed forces were increased from 150 lbs to 156 lbs. The mid speed needed to be increased, so the mid speed forces were increased from 662 lbs to 695 lbs. High speed forces, even thought not directly targeted, will increase from 1230 lbs to 1295 lbs. We can not directly measure this increase on the dyno, but it is safe to say the high speed increased as well. Chart 5 shows an example where the low speed and high speed are increased. The mid speed would be affected and increase as well. Remember, valving changes affect the entire curve. Later we will look at ways to to try and alter the rate of the curve. A tuner adjusting a shim stack can try hundreds of possible shim combinations. This can get a little overwhelming and lead to a lot of time spent testing. However, if we look at valving changes as adjusting the force-velocity curve, the possibilities can narrowed down to 8 basic combinations. 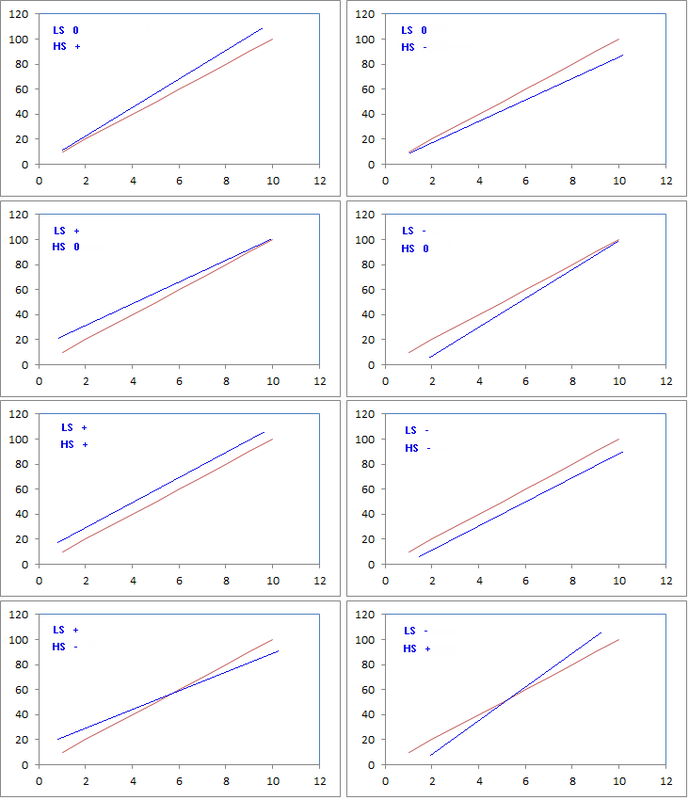 The 8 basic combinations show how opposing ends of the curve are increased or decreased. There can be countless variations in the amount each end is changed. Much has been said about altering the entire force-velocity curve. All that is meaningless unless we can relate the force-velocity curve directly to rider feedback. The accepted method for suspension tuning is for the tuner to make a valving change, the riders tests it and provides feedback. The tuner is making a direct correlation between the shim change and what the rider feels. The tuner makes changes to the shim stack to address the riders' issues. With the use of the dyno, the tuner makes a valving change, quantifies the change on the dyno, and then the riders tests it and provides feedback. The tuner is now making a direct correlation between the force numbers of the damper and what the rider feels. The tuner makes changes to the force-velocity curve to address the riders' issues. Changes are made to the shim stack to alter the appropriate area of the force-velocity curve. This method adds a step between the valving changes and rider feedback, allowing the tuner to know exactly how he altered the force-velocity curve (as per the dyno). The tuner no longer has to guess what the shim changes are doing, and then guess again and try to match that to the riders feedback. The next next logical step would be to pinpoint how the force numbers translate to rider feedback. We'll look into that in future sections.